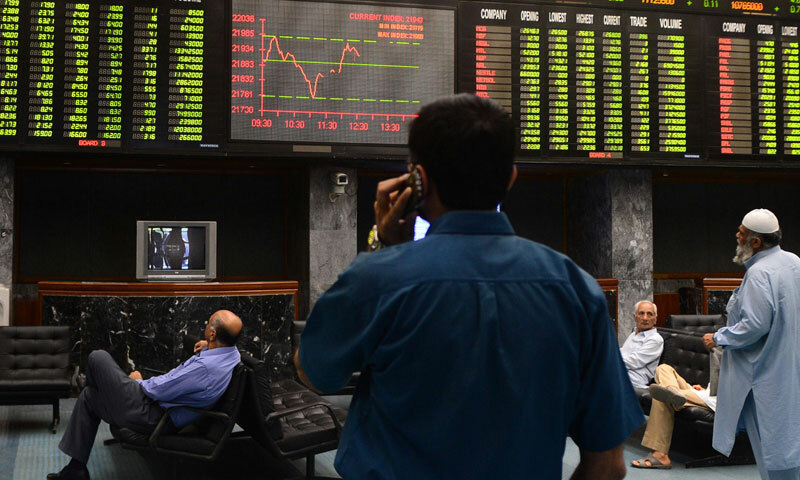 KARACHI, June 3: Shares galloped on the stock market on Monday with the KSE-100 index soaring 257.80 points to cross the barrier of 22,000 points and settle at 22,080.85 points. The market was volatile with the index oscillating between the day�s high at 22,155.56 and low at 21,779.30 points. The jump in the index appeared to be out of step with reality. The gains were accounted for mainly by increase in price of the heaviest weighted stock in the KSE-100, OGDC, by Rs7.55, which contributed almost 140 points to the index. Gains in other heavyweight oil and gas stocks, such as POL up by Rs958 added more than 50 points to the index. The gaining stocks at 216 were ahead of the losers at 159. Another 16 shares remained unchanged with total 391 stocks coming up for trading on Monday. Foreign investors continued to pour liquidity in the market with net purchases of stocks worth $1.36 million on Monday, yet it was the mutual funds who were major buyers of shares valued at $6.51m on Monday. Among other local participants, the �individuals� and �other organisations� also picked up equities worth $0.69m and $0.52m respectively. On the other hand, �companies� offloaded a heavy $7.52m worth shares. They were followed by �banks�, also seller of shares valued at $1.56 million. Volume of shares traded decreased by 11.4 per cent to 573 million shares, from 647m shares last Friday. Trading value declined by 8.4pc to Rs11.745 billion, from Rs12.828bn. Market capitalisation saw addition of Rs70bn to Rs6.363 trillion, from Rs5.293tr on Friday. Analyst Veerbhan Bajaj at JS Research stated that oil and gas sector was amongst the pick of investors during the day with OGDC, PPL and PSO closing up by 3.1pc, 1.7pc and 1.2pc, respectively. BOP-Right dominated the third tier stocks as it came under selling pressure after last three days of rally. The analysts noted that strong investor participation was witnessed, but warned investors to be cautious at these high levels. Dealers at Sherman Securities stated that the market was volatile from the start of trading. However the ending was remarkably good. The index was up 0.8pc in the morning but then saw profit taking and dipped into the red. Yet it picked up late based on low inflation numbers at 5.13pc and continued foreign buying apparently in NML, OGDC, PSO and PPL. The roadshows being conducted abroad by a brokerage house this week and the KSE�s plans to hold roadshows next week in US, boosted investor sentiments. The biggest gainers for the day were Colgate Palmolive up by Rs79 to Rs1,889, while the steepest decline was noted in Pak Services down by Rs19.40 to Rs368.60. BoP and BoP right shares contributed 28pc to the overall volumes. BOP (R) stood at top of volume leaders� list with trading in staggering 118 million shares. The right share lost 86 paisa to Rs4.30. BOP on ready counter lost 61 paisa to Rs14.19 on 39m shares. Fauji Cement gained 39 paisa to Rs12.30 on 25m shares, Jah Sidd Company was up by 12 paisa to Rs13.89 on 22m shares, TRG Pakistan shed 22 paisa to Rs11.59 on 21m shares and NIB Bank declined by 15 paisa to Rs2.82 on 19m shares. Maple Leaf Cement rose by 34 paisa to Rs22.07 on 16m shares, PIA hit �upper lock� with addition of Re1 to Rs9.13 on 15m shares, KESC inched up by 14 paisa to Rs7.44 on 15m, Southern Electric Power Company (Sepco) rose 3 paisa to Rs4.70 on 14m shares.